Ergonomics is the science that fits the job to a person's anatomical physiological and psychological characteristics in such a way that it enhances human efficiency and well-being. (International ergonomic Association). The goal of ergonomics is to stabilize a safe, healthy, and comfortable working environment, thereby preventing health problem and improving productivity. Dentistry is a profession where clinically operational skill is restricted to an area covering the teeth and the mouth, which requires repeated, precise force application while delivering oral health services. The prevalence of MSD among dental practitioners is not well documented in India. Moreover, since the number of dentists in Delhi National Capital Region (NCR) is increasing exponentially, it becomes imperative to research any such WRMSD in such population. Thus, there arises a need to know about WRMSD among dentists in Gurgaon, part of Delhi NCR. To assess the anatomic distribution of dentists with work related musculoskeletal complaints. Data were collected in a set time frame of 4 months from March 2014 to June 2014 and by random convenience sampling a set of 206 dentists voluntarily participated in the study. The inclusion criteria were set with only those dentists having a clinical practice of 3 or more than 3 years. As exclusion criteria those unwilling to participate and having experience <3 years were not included in the study. The reason being that they must not be exposed to the practice to develop musculoskeletal complaints. As the occupational hazard of WRMSD would become a major concern if dentistry is practiced in an un-ergonomic manner and also for a longer duration in the same manner. The sample was divided on the basis of four age groups. The data were analyzed to check for associations by Statistical package of social sciences. (SPSS, Chicago, IL, USA) version 17. The statistical significance was set at P < 0.05. A total of 206 dentists formed part of a study with 106 being males and 100 females. 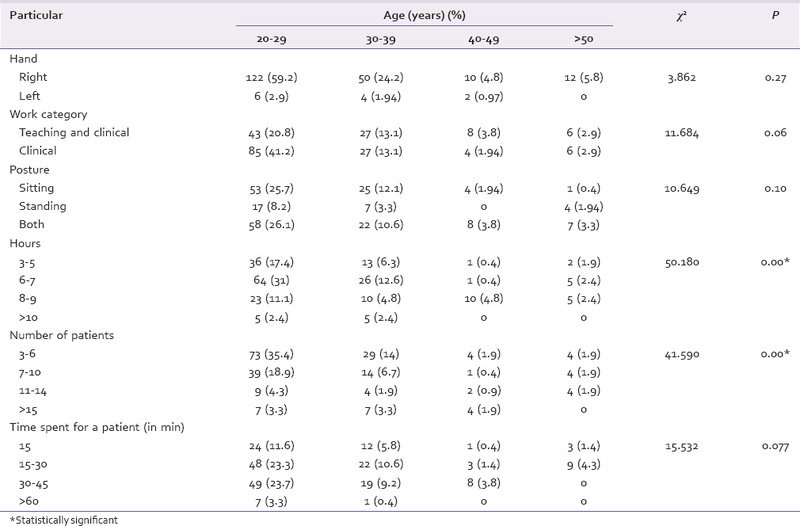 The sample was categorized into four age groups 20-29 years, 30-39 years, 40-49 years, and above 50 years [Table 1]. The gender distribution among dentists and number of patients treated and the amount of time spent on a patient per day revealed a higher statistical significance (P = 0.00 and P = 0.022) [Table 2]. The physical activity among male and female dentists was found to be statistically significant P = 0.005. 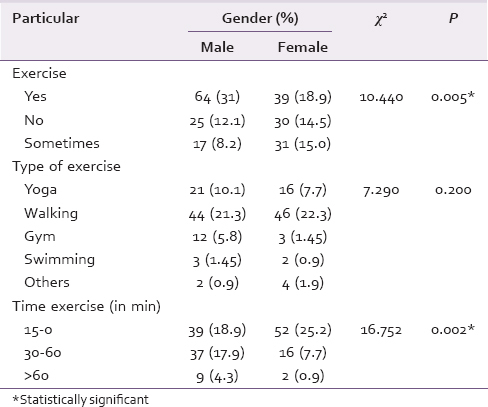 The amount of time spent by the male and female dentists for exercise in a day was statistically significant (P = 0.002) [Table 3]. According to the Nordic questionnaire the regions affected among male and female dentists were statistically significant (P = 0.00). The different self-management strategies among dentists showed a statistically significant value (P = 0.00) [Table 4]. The association between age of dentists and daily practice hours had a statistically significant value (P - 0.00). When checked for a number of patients treated per day also had a statistically significant value (P - 0.00) [Table 5]. 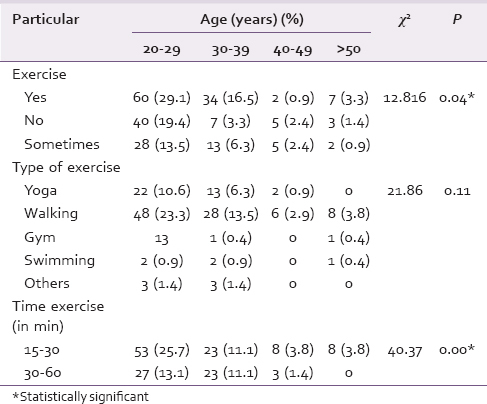 The time denoted for exercise per day by the dentists revealed a statistically significant value (P - 0.00) [Table 6]. The regions affected among different age groups of dentists had a statistically significant value (P - 0.00). 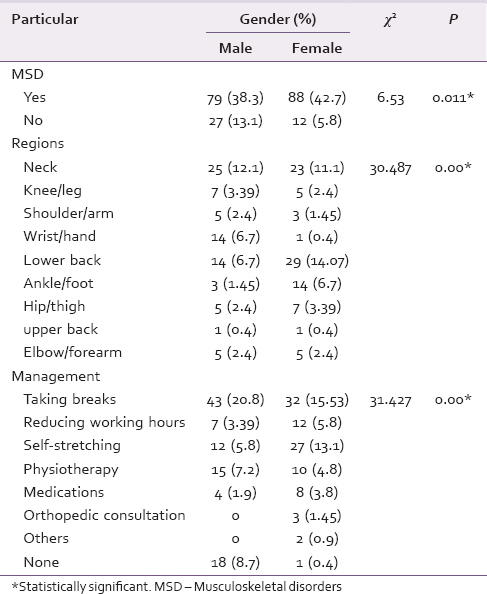 The self management strategies used by the dentists for the prevention of MSD also had a highly significant value (P - 0.00) [Table 7]. Results regarding the associations between different body regions with male and female dentists revealed a statistically significant value (P = 0.00). Female dentists were experiencing more pain in lower back (14.07%), ankle/foot (6.7%), and hip/thigh (3.39). On the other part, the male dentists experienced pain in other regions such as neck, wrist/hand, shoulder/arm, and knee/leg according to the present study. 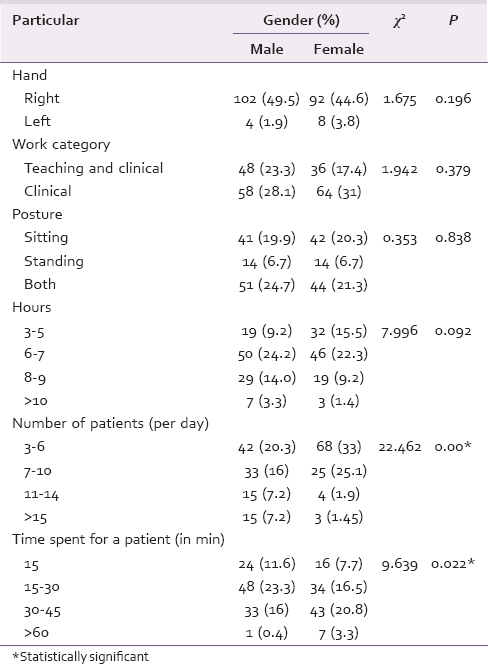 The practicing posture of the dentists revealed that dentists chose working in alternative sitting and standing position more. Ratzon et al. concluded that those working in sitting position alone had more severe low back pain than those who alternated between sitting and standing positions. Dentists predispose to pain/injury in different regions of the body depending on the type of work and position adopted. In the present study, the commonly affected areas were neck and lower back, which were similar to the study from Newzealand,  which showed a high prevalence of MSD among General Dental Practitioner regardless of the qualification and specialty, the prevalent site affected was low back and neck. These results indicate that most of the practitioners adopt positions, which frequently result in MSD of the neck and low back regions. However, Puriene et al. have reported that most prevalent musculoskeletal complaint was MSD of the low back, which could be attributed to forward positioning of the operator to gain access to operating site. Most of the dentists were found to be physically active. The association between physical activity and gender of dentists was justified in this study by showing a significant value. Kumar et al. found a significant association between lack of physical activity and a number of regions affected and also with the percentage of dentists with recurrence for symptoms. The inclusion criteria of minimum 3 years of experience for the dentists participated was the limitation of the study, whereas all the dentists who practice, irrespective of experience should be assessed for the musculoskeletal complaints. The high prevalence of MSD in this study suggests the need to identify the factors predisposing to MSD among the dental practitioners. Dental surgeons must become more educated regarding the impact of their choices in seating in their work area. Therefore, the smart and modern dentist would definitely opt for the better option of adopting ergonomics rather than suffer its contrary. Based on the findings of this study, it is concluded that WMSDs occurred in higher rate (81%) in Delhi NCR. All the dentists in the study had a musculoskeletal complaint with regard to one or more anatomical sites. Dental surgeons must become more educated regarding the impact of their choices in seating in their work area. Improper adoption of ergonomics may cause untoward changes in our body leading to WMSD. The prevention and reduction of MSDs among dentists should include their education in dental ergonomics through regular CDE programs and awareness regarding the importance of work related risk factors. I want to thank all the people who helped in my study. Karibasappa GN, Sujatha A, Rajeswari K. Dentist′s knowledge, attitude and behavior towards the dental ergonomics. IOSR J Dent Med Sci 2014;13:86-9. Meenakshi S, Raghunath N, Nandlal, Murlidhar NV. Work related musculoskeletal disorders among general dental practitioners of Mysore district, Karnataka - A questionnaire survey. Int J Health Sci Res 2014;4:131-41. Mamatha Y, Gopikrishna V, Kandaswamy D. Carpal tunnel syndrome: Survey of an occupational hazard. Indian J Dent Res 2005;16:109-13.
censusindia.gov. Available from: http://www.censusindia.gov.in/2011census/population_enumeration.html. [Last assessed on 2015 Aug 03]. ncrpb.nic.in. Available from: http://www.ncrpb.nic.in/index.php. [Last assessed on 2015 Aug 03]. www.practo.com. Available from: http://www.practo.com/gurgaon/dentist/gurgaon. [Last assessed on 2015 Aug 02]. Crawford JO. The Nordic musculoskeletal questionnaire. Occup Med 2007;57:300-1. Muralidharan D, Fareed N, Shanthi M. Musculoskeletal disorders among dental practitioners: Does it affect practice? Epidemiol Res Int 2013;2013:1-6. Puriene A, Aleksejuniene J, Petrauskiene J, Balciuniene I, Janulyte V. Self-reported occupational health issues among Lithuanian dentists. Ind Health 2008;46:369-74. Abduljabbar TA. 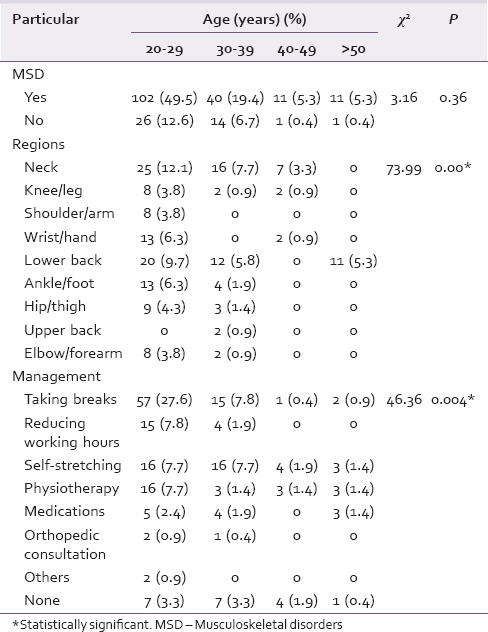 Musculoskeletal disorders among dentist in Saudi Arabia. Pak Oral Dent J 2000;28:135-44. Barry RM, Woodall WR, Mahan JM. Postural changes in dental hygienists. Four-year longitudinal study. J Dent Hyg 1992;66:147-50.